The life of a boxer is far from an easy one many have even referenced it as the toughest and loneliest sport on the planet. 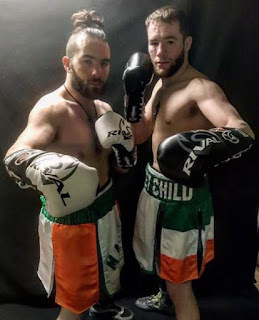 Luckily for brothers Matt and Mike Conway of Pittsburgh, they have each other to lean on and to push one another in and out of the gym as they both prepare for bouts this upcoming Saturday at the Mountaineer Casino and Resort Ballroom. Though the brothers have fought on the same card before, this one seems to be a little more special as the older Conway, Mike is coming back from a shoulder injury which he was forced to rehab for 11- months prior to resuming his boxing workouts. "It's been a great rehab and our strength coach really pushed me," said Mike about his return from a shoulder injury which has kept him out of the ring since June. "It's feeling a lot stronger than its ever been and my left hook is going to be a big thing". While the Mike, 24, will look to not only rebound from an injury but also defeat after suffering a decision loss to Latorie Woodberry at the Rivers Casino this past summer, his younger brother Matt will look to keep his perfect record intact. Though Matt, 23, has built up more fanfare and recognition with his 15-0 record, there is no bigger fan of his than Mike. "We feed off each other," said Mike (3-2) who will face off against David Veras Pena (0-1) in a 4-round super lightweight contest. "I know he's where I want to be in my career where he's at right now so I know it pushes me". Matt, who will take on Jose Antonio Martinez (11-16) in a scheduled 8-round super featherweight contest in the evening's main event was quick to echo his brother's remarks of feeding off one another's energy through camp. "The things he's doing right now is what I'm doing for an eight-round fight so he should have the utmost confidence that he can go balls to the wall for four rounds". The Conway brothers know that besides one another, they would not be in the position in which they are without their team. "The biggest ones behind us right now are our coaches, our dad, our strength coach, coach Ryan Rimsek, and Skeets Lavandosky they put in with us for the past ten weeks pushing us physically and mentally and we can't thank them enough," said Matt. While they both will enter the ring alone this upcoming Saturday night, the Conway brothers know they are not going to battle alone.